Saudi Arabia And UAE Give Nearly $1 Billion In Aid To Yemen. What Do Critics Say? : Goats and Soda The money was pledged by Saudi Arabia and the United Arab Emirates, two countries that have fueled the country's humanitarian crisis. Aid groups from Yemen and beyond weigh in. 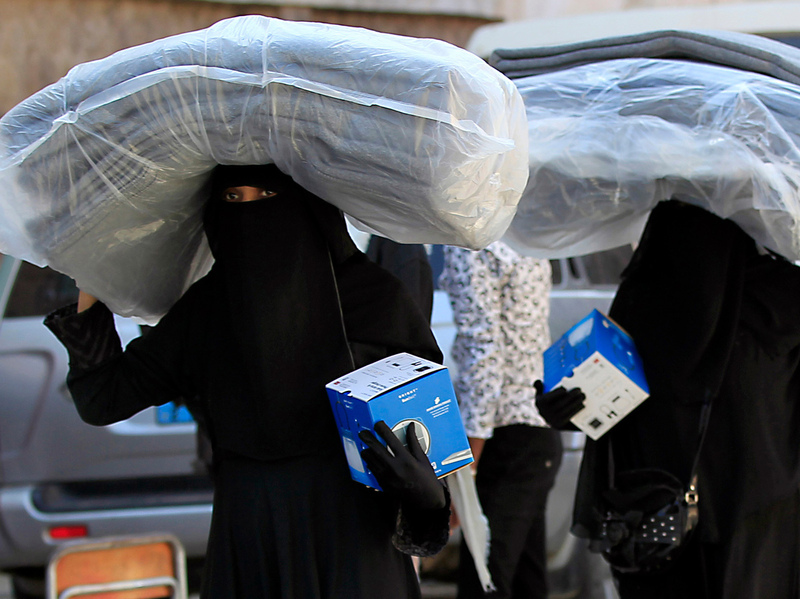 Yemeni women carry blankets and lanterns distributed by the United Nations High Commissioner for Refugees in Sanaa, Yemen. The funds from the two countries cover almost a third of the $2.96 billion required to implement the U.N.'s budget to help Yemen in 2018. An additional billion in funding was secured yesterday at a U.N. pledging conference in Geneva. The money will be disbursed to local and international aid groups in Yemen. In a meeting in New York last week, U.N. Secretary-General Antonio Guterres expressed his "deep gratitude" to Prince Mohamad Bin Salman Al Saud, Saudi Arabia's crown prince. But he went on to urge the Saudi government to protect civilians, abide by the rules of war and lift the blockade on Yemen's ports. Saudi Arabia and UAE are indeed players in Yemen's complicated civil war. The conflict began as an internal fight between rebels and Yemen's government, but escalated when Saudi Arabia intervened on behalf of Yemen's government to fight the Houthi rebels, who are backed by Iran. Rights organizations like Human Rights Watch have criticized the Saudi-led military coalition, which includes the United Arab Emirates, for launching "indiscriminate and disproportionate" aerial and ground campaigns. The Saudi-led coalition has also enforced an on-again, off-again blockade to prevent aid and commercial goods from entering the country. Nasser and Wahish confirmed their statements in an email to NPR. But there are differing opinions in Yemen. Fatima Abo Alasrar, a Yemeni senior analyst who conducts research in Yemen for the Arabia Foundation, a think tank in Washington, D.C., attended the U.N. pledging conference for Yemen in Geneva this week. In the side events that she attended, she says the general mood among Yemenis was "happy of course" but "not surprised." Saudi Arabia has historically been a strong ally to Yemen. "It's the only country giving aid in such huge figures to Yemen," she says. In January, for example, the Saudi government announced they'd give $1.5 billion in funding to Yemen. The debate over the $930 million is part of a larger conversation about funding for humanitarian aid. Medecins Sans Frontieres, for example, does not accept funds from certain governments. According to MSF, about 95 percent of its funding comes from individual donors. "We respect our independence and neutrality," says Christine Jamet, director of operations at MSF Switzerland. "We want to keep this freedom to base our patient's needs not on a political agenda or government donors but on our own assessments." Currently, MSF works in 13 hospitals and health centers in Yemen. These efforts are not funded by countries like Saudi Arabia, UAE or the U.S., which backs the Saudi-coalition by providing intelligence and logistical support. But Robert Mardini, the Middle East regional director for the International Committee of the Red Cross, says he would accept the money. The ICRC has, over the past year, distributed food, clean water and essential household items to 4 million people in Yemen. "It's perfectly normal for aid groups like the ICRC to accept money from governments, provided that we are able to spend it in an impartial way," he says. Last year, for example, the group accepted $10 million from Saudi Arabia for their efforts in Yemen, according to ICRC spokeswoman Iolanda Jaquemet. But Mardini does not believe that a donation can wipe the slate clean. It certainly will not "exonerate [Saudi Arabia or UAE] from their responsibility to uphold international humanitarian law," he says. "We will continue to have dialogue with Saudi Arabia, the UAE and armed groups to improve their behavior [on the ground]." "The fact of the matter today is that the top donors are linked to conflict," adds Mardini. That was the case during the Iraq war, says Spiegel. Just a month after the U.S. invaded Iraq in March 2003, Congress approved $2.5 billion in relief aid, such as food, medicine and water, through the Iraq Relief and Reconstruction Fund — 97 percent of which was disbursed. But for Yemeni aid workers like Nasser, a billion dollars in aid funding doesn't solve anything. "We don't need money from Saudi Arabia," he said. "What we need is for them to stop the war."